Signed to a two-year, $6 million contract in the summer, Bucks point guard Jerryd Bayless is playing for his sixth team since being drafted No. 11 overall out of the University of Arizona by Indiana in 2008. ST. FRANCIS, Wis. — With the way Bucks coach Jason Kidd balanced minutes throughout the preseason, it was difficult to get a grasp on a variety of different rotation-related things. One question left unanswered following the exhibition season was who would serve as Brandon Knight’s primary backup at point guard. Three games into the season, Jerryd Bayless is getting the first crack at those duties. "He competes," Kidd said. "He wants to win, and he wants to do the right thing. The things he’s done for us all preseason and the first three games is competing on the defensive end and then offensively, setting us up to get into plays. That’s the nice thing about having him at point guard. "But we also are able to go with a small group out there of guys who are competing on the defensive end and driving the ball and touching the paint on the offensive end." Signed to a two-year, $6 million contract in the summer, Bayless is playing for his sixth team since being drafted No. 11 overall out of the University of Arizona by Indiana in 2008. Bayless has played a similar role to the one he’s in currently with the Bucks for the majority of his career and has turned himself into a solid bench player in the NBA. After playing just 14 minutes in each of Milwaukee’s first two games, Bayless received 20 minutes against Washington on Saturday night. In search of energy on the second night of a back-to-back, Kidd played a small lineup for a good chunk of time Saturday. With primary bench scorer O.J. Mayo struggling and in foul trouble Saturday, Bayless scored 20 points in 20 minutes off the bench in Milwaukee’s 108-97 loss to Washington. "If we need (a scoring spark), I know I can provide one," Bayless said. "But at the same time, we have enough guys in the second group where it is really just trying to get them going. There was a need for it Saturday, so I tried to pick it up a little bit. O.J. had two early fouls. "I was just trying to be more aggressive. We have a lot of guys who are capable of doing it." Early on, Milwaukee’s second unit has consisted of Bayless, Mayo, Giannis Antetokounmpo, Ersan Ilyasova and either John Henson or Zaza Pachulia at center. All of those players are capable of putting the ball in the basket, which could give the Bucks an advantage over teams with less depth on the second unit. Milwaukee has had a bench player score at least 17 points in each of its first three games. "There are a lot of different options," Bayless said. "Hopefully we can continue to take advantage of whoever has it going that night. It will be OK then." Knight is playing at a high level early on, averaging 19.7 points, 6.7 rebounds and 9.0 assists through three games. However, the backup spot may fluctuate throughout the season. Bayless has played the most off the bench of the three other point guards on the roster, as Kendall Marshall and Nate Wolters have played a combined 21 minutes thus far this season. "Being able to play at our pace, our tempo, Kendall does well for us," Kidd said. "He came in and had a couple of good looks Saturday. He’s working extremely hard. When their names are called, guys are giving us positive minutes. "Kendall understands he has to be ready. He’s our left-handed reliever. He can be in the mix quickly. He controls the pace and helps get us going. Everybody understands they’re all on deck. Anybody could be called upon." Early impression: While Bucks rookie Jabari Parker hasn’t shot a high percentage from the field in his first three NBA games, the 19-year-old has still managed to make a bit of history. Parker is just the 14th player in the last 30 years to record multiple double-doubles within his first three games, joining Michael Carter-Williams (2013), Blake Griffin (2010), James Singleton (2005), Emeka Okafor (2004), Jamaal Tinsley (2001), Tim Duncan (1997), Damon Stoudamire (1995), Shaquille O’Neal (1992), LaPhonso Ellis (1992), Christian Laettner (1992), Dikembe Mutombo (1991), David Robinson (1989) and Patrick Ewing (1985). Additonally, Parker is the first teenager to record multiple double-doubles during the first three games of a career. Anthony Davis (2012), Derrick Favors (2010), Luol Deng (2004), Dwight Howard (2004), LeBron James (2003) and Lamar Odom (1999) are the only teenagers in the last 30 years to even record one double-double over their first three career games. 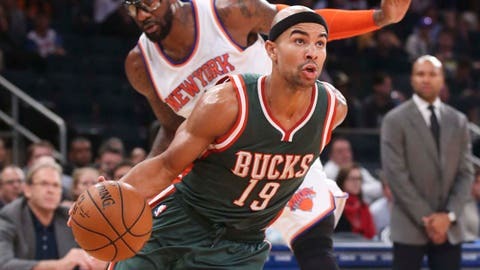 Parker scored 11 points with 10 rebounds in Milwaukee’s 93-81 victory over Philadelphia on Friday and then scored 13 points with 11 rebounds Saturday against Washington.